Apart from the beauty aspect of dog showing, there are many other dog sports that can be enjoyed by dog owners. 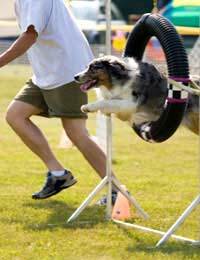 Agility, as the name implies, is where the dog and owner show their aptitude to be agile over a set course and within a time limit. Every year when the Crufts dog show is transmitted on the television, the viewer is able to see the teams of dogs and handlers, from all parts of England competing in Agility competitions. The audience enjoys this sport almost as much as those participating and can often be heard as they cheer and shout their support for their favourite team. The dog runs a course set out by the agility judge. The handler must not touch the dog or the equipment but controls the dog by voice and signal alone. Classes have different levels of aptitude based on the aptitude of the dog and what classes they have competed in (and points gained) previously. There may not be as many agility clubs as there are ringcraft or obedience but the Kennel Club holds a list that covers all of the United Kingdom. If you are interested in this sport ask at your local dog training club they may have an agility section or perhaps a member can direct you to a club that trains newcomers. For information on all clubs registered with the Kennel Club visit their website. 2007 has seen a big change in the structure, grading and classes within agility competitions, after careful discussion with societies and competitors. It is hoped that the new class structure will be easier to follow and supported by current competitors. There are agility competitions for different sizes of dog as well as different levels from beginners up to championship level. Dogs will always compete against other dogs of a similar size. Dog and handler also compete in teams, these may sometimes be dogs of the same breed but usually they are members of the same Kennel Club licensed society. Just as the beauty side of the dog world is now international, so is the agility side. With the introduction of the Pet Travel Scheme dogs and handlers from the UK can now travel to international championships and shows. The number of jumps, tunnels, weaving poles and tables/boxes where the dog has to stay still for a certain time are all dependent on the class level. As a dog cannot be expected to remember the set course it is up to the handler to have learned the course and be able to transmit commands to the dog. The individual clubs usually own equipment but it is possible to purchase the jumps or make your own for more intense training at home. Many people who exhibit their dogs also attend agility classes for the sport and competition. Even if agility is not for you why not visit an agility competition and watch for yourself the fun involved in another aspect of canine competition? The exuberance and speed, the cheers from the sidelines make competing in agility a great spectator sport.